The time has come, my friends, for me to host my very first ever Ready Set Read Reviews book giveaway! 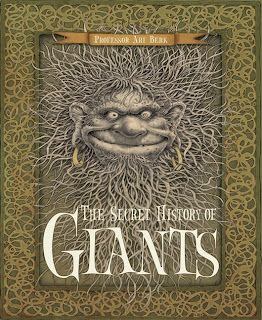 It's unfortunately not something I can afford to do all the time, but Candlewick Press has ever so generously donated a brand new hardcopy of Professor Ari Berk's The Secret History of Giants for me to giveaway here on my blog. Because I haven't read the book, I can't post a review. However, I can say that, after having taken a quick peek between the covers, that it looks like a really cool book. From the textured front cover to the incredibly detailed illustrations to the neat surprises included on many of the pages. It just looks like a fun book! giants since antiquity, from their role in forming mountains and causing earthquakes to the mysteries of their sacks (watch out for hitchhiking humans); from their means of employment (how did the Druids built Stonehenge?) to an extensive map of places around the world where giants may likely be found. Exhaustive and lushly illustrated, this enormously valuable resource is sure to fascinate all who open its covers. Are there giants among us? Find their story writ large in a lavish exploration touching on folklore and myth, truth and whimsy. If you live in the US and think this book sounds like something you'd be interested in winning for yourself or a special child in your life, please leave me a comment here telling me about your favorite folklore or mythical creature. With the Thanksgiving holiday coming up next week, I'm going to leave this open for entries through Friday December 5th. I'll then do an online random draw to determine which lucky reader will be taking home this prize just in time for Christmas. Due to cost of postage, US entries ONLY on this first giveaway. I'll see how it goes, and then consider my options again in the future. This book looks interesting for my older child-- we'll have to check it out. A favorite mythical creature, huh? The first thing that popped into my head was the Cyclops from mythology. Oh, and Medusa-- does she count? As a kid, I loved the image of the snakes as her hair-- way spooky! My favorite creature is the German animal Wolpertinger. I remember traveling in Munich (not speaking German) after college and buying a ticket to a museum that had these bizarre creatures set up. I vaguely remembered the tales of soemthing of the sort from when I was 8 and living in Belgium, but seeing them absolutely cracked me up. The friend with me mentioned that it looked like the taxidermist had gotten drunk one night, and that was the result. They'll always have a special place in my heart (especially after I went back to read up on them after seeing the exhibit!). Oooh...my daughter would love this book! My daughter's fave creature is Goliath. We both love stories about vampires. (I hope that counts because I'm not up on my mythological creatures!) Thanks for the great giveaway! I also posted the giveaway in my blog sidebar! I love to win this for my niece my favorite is Zeus. This would be a great gift for my 8 year old cousin! She is starting to really like reading. Thanks for your contest and I've added it to my blog. I've also added your blog to my blogroll. My grandchildren would love this book. My favorite is the Loch Ness Monster! My Grandchildren would love Nana to read this to them or some of them would love it for themselves. I also have a new little one on the way who I know would love it in a few years. I would also love to win this book as I was a Public Librarian and School Librarian and I would review books for the kids. The cover of this book is amazing. I would love to read it with my children. Looks spooky and my daughter loves a good scare hehe. My favorite mythical creature is the unicorn. I've seen Legend so many times, and the unicorn is gorgeous. Mermaids are also pretty cool. I'd love to win this so I can give it as a gift to one of my daughters. Thanks for the chance! My favorite mythical beings are Faries!!! I know my neice will love, love, love this book! AAACCKK!! I thought I had already entered this! Good thing I double checked! My nephew would LOVE this book - and I would, too! Thanks for a chance to win a copy. My favorite folklore or mythical creature has always been the Yeti...I've never read any books about this creature, but my father had a big picture book which I remember with fascination all about the Yeti. Thanks for the giveaway! I promoted your giveaway here: http://www.luck-happens.com/december-5.html.